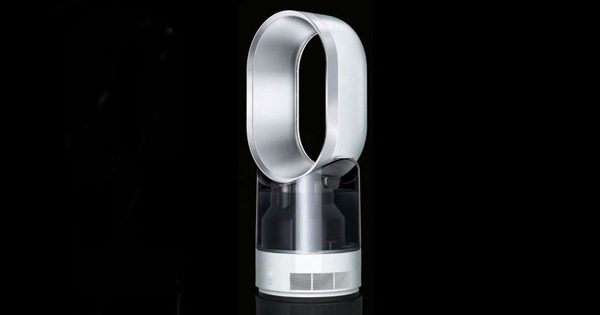 Dyson reveals its first ever humidifier... and it's amazing! Dyson reveals its first ever humidifier… and it’s amazing! We already love them for their vacuums and no-blade fans. Now Dyson has released its first ever humidifier and, of course, it’s the most impressive humidifier we’ve ever seen. Like other humidifiers, the Dyson humidifier helps banish dry air from your home to ease breathing problems, allergies and other ailments. This is especially important in winter, when colds and sniffles can make breathing tricky, especially for little noses. As well as keeping nasal passages lubricated so breathing is easier, a humidifier can also help with chapped lips, dry skin and blocked sinuses. It can even help solve snoring! But here’s the special bit. What this one does differently – and what makes it so clever – is that the Dyson humidifier actually cleans every drop of water before dispersing it hygienically into the air, making sure that 99.9 per cent of the bacteria is banished before it can enter your home. It does this using ultraviolet light, treating the water not just once, but twice to make sure no microscopic nasties like E.coli are left to get into your home and make people sick. Take a look at this video to see how it works. And while you watch, consider this – it cost more than $63.5 million and 643 prototypes to get this new humidifier just the way Dyson wanted it. That’s some pretty impressive figures. Dyson says its new machine is one of the most advanced humidifiers on the market and uses Intelligent Climate Control to measure both the temperature and the moisture in the air, thus creating a comfortable and hygienic environment for the whole family. The Dyson humidifier can hold three litres of water and should last for 18 hours. It comes with a remote and can even be set to turn on or off during the night. It works as a fan too so it’s perfect for using to keep the temperature and air just so all year round in nurseries and children’s rooms. The Dyson humidifier retails for $799 and is available direct from Dyson and retailers nationally.